Today Typhoon Jebi barreled through Western Japan, hitting cities like Kyoto, Kobe and Osaka, where I live. Kyodo News reports that Jebi was moving at over 60 kilometers per hour with gusts of wind reaching over 200 kph. 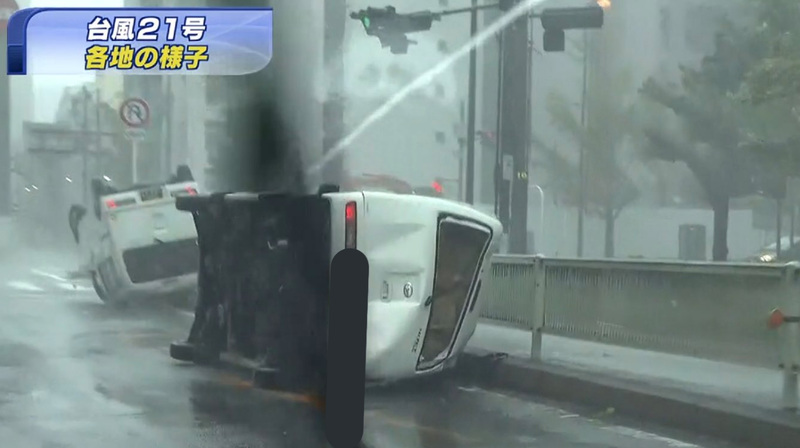 According to the local news, these are the strongest winds to hit Osaka in 57 years. We were able to weather the storm, even as we experienced multiple power outages and even as the windows rattled so hard I thought the windows were going to shatter. Other family members weren’t so lucky, suffering damage to their homes. I hope everyone in Jebi’s path is safe. There have been injuries, but as of writing, there have been no reports of casualties. Update September 4 - 4:45am: According to local news reports, there have been two casualties. Update#2 September 4 - 5:19pm: Local Japanese news reports that there have been seven casualties. Update#3 September 6 - 1:40am: The number of casualties has climbed to 11.